The majority of our growing medium is supplied by one company. We use this company for one main reason, quality. 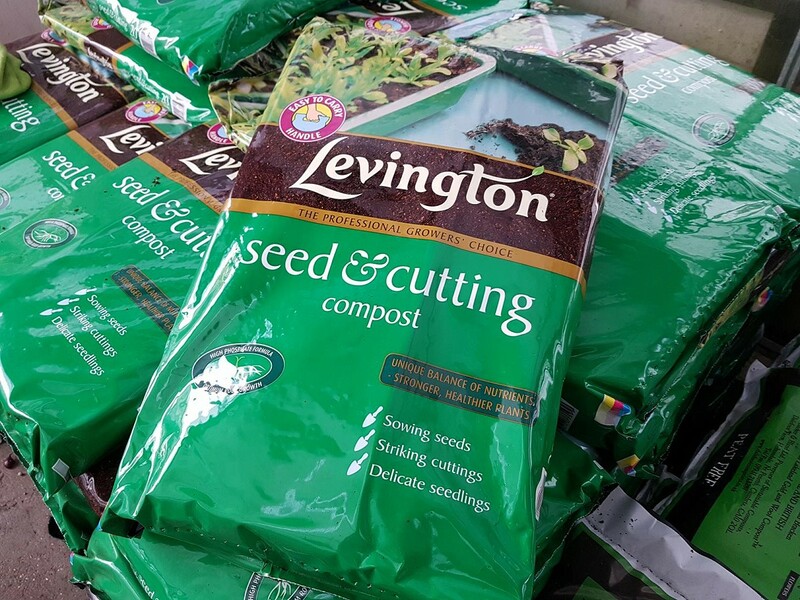 We have found over the years that Levington, which is now part of the Scotts Miracle Gro group, has provided consistent levels of quality and affordability. 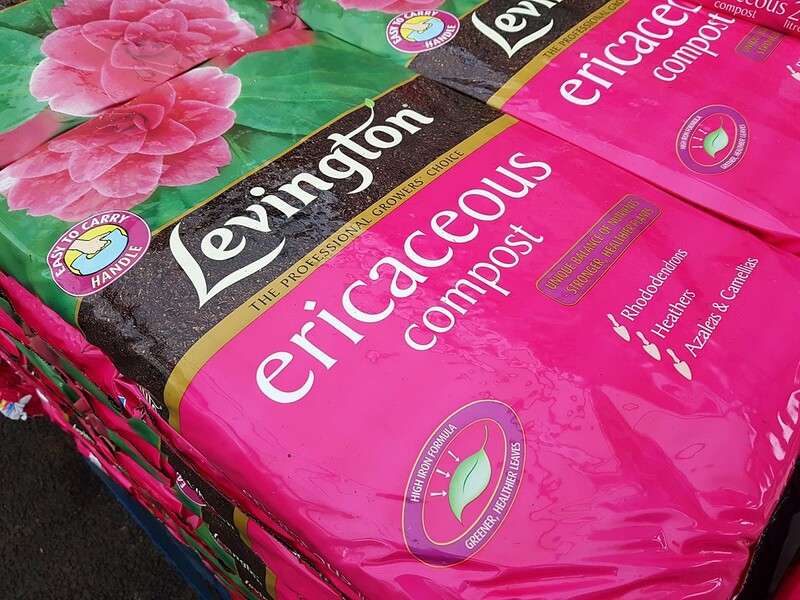 Their professional grades of composts are used in our nursery for all growing. 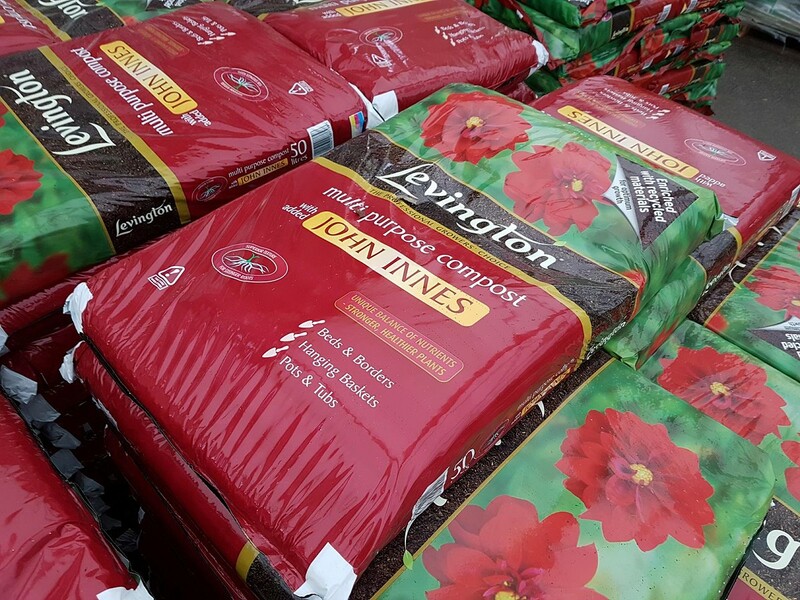 The fact that we use Levington to grow our plants should give you extra assurance on it suitability and quality. 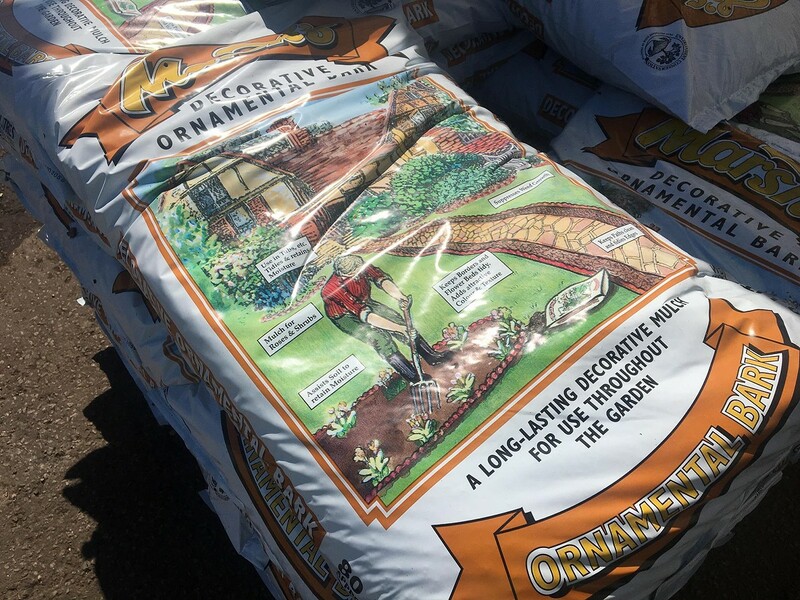 The quantity of professional compost coupled with the large amount of retail compost that we order gives us excellent buying power, meaning that we can secure the best possible price deals available. It even means that we are able to sell some of their comercial grade composts direct to you. 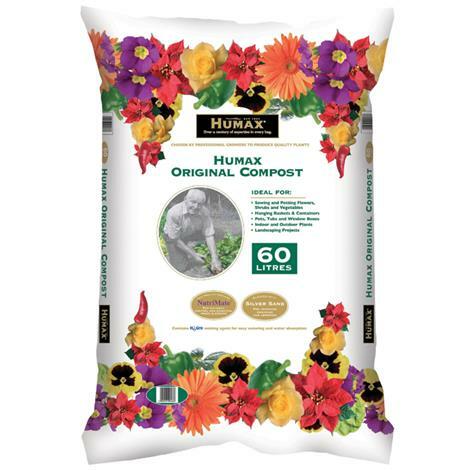 For example, we stock a premium grade hanging basket - container compost which is our specific formula, containing a long lasting feed. However we are aware that some people do not like the Levington / Miracle-Gro brand, which is fine. There are other brands here that can satisfy most budgets or preferences. 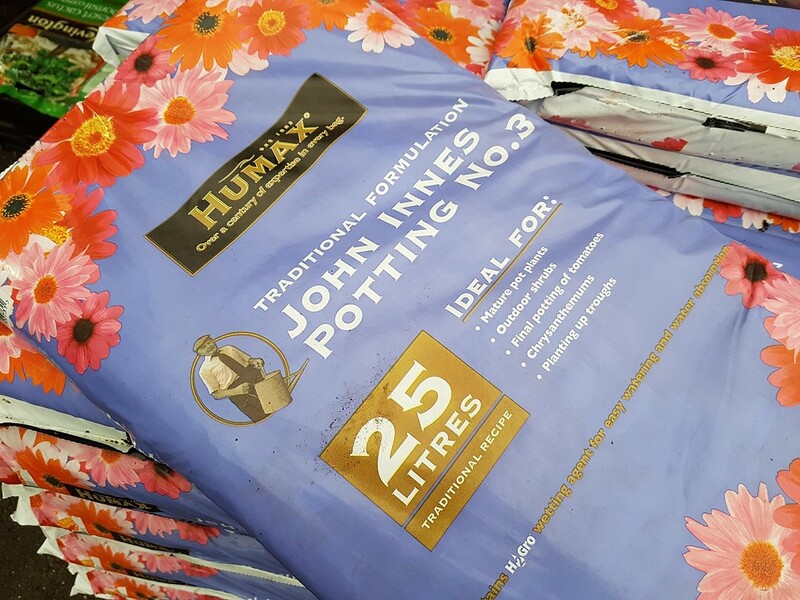 In our opinion one of the best ‘old fashioned’ style composts is made by Humax, we have their multi-purpose & John Innes products. At the budget end of the spectrum you can find Camelot, a brand from Michael Kings horticulture which really offers affordable quality. 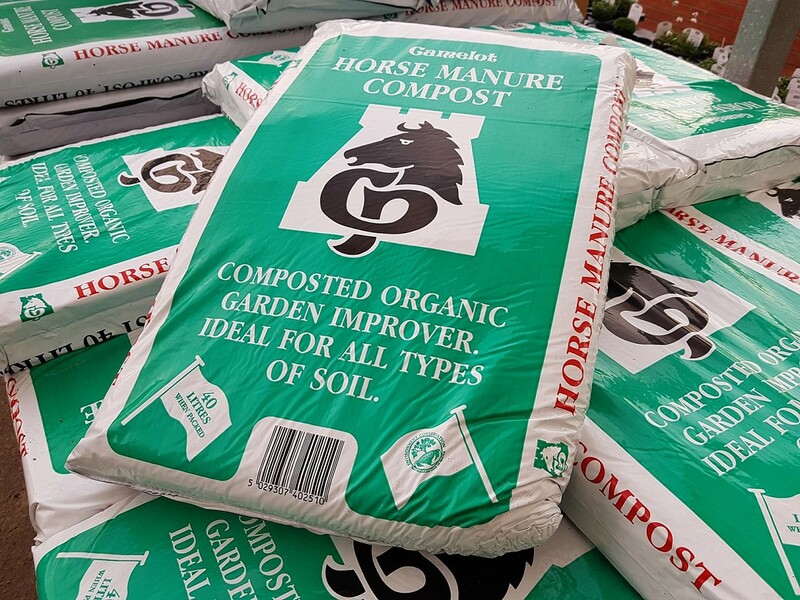 We stock several items from their range including composted horse manure & organic compost. 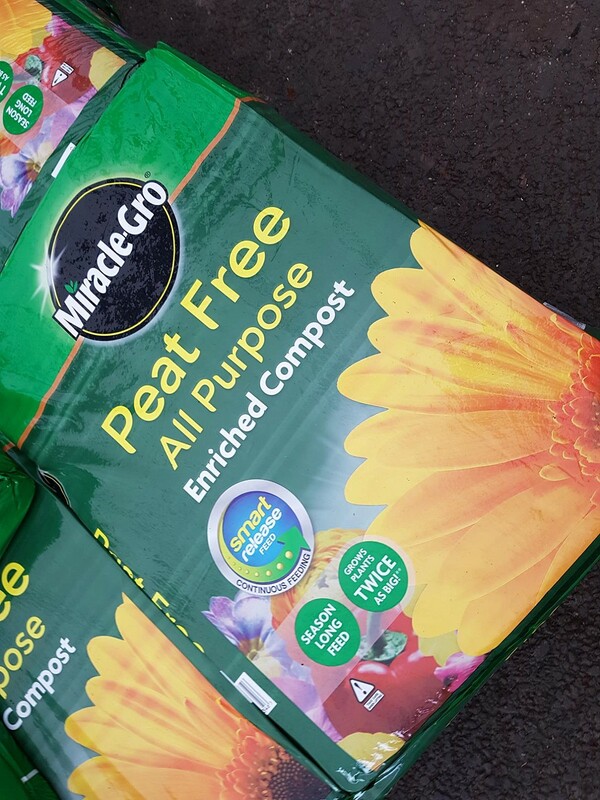 Whilst we are on the subject of organic compost, lets us mention a ‘peat free’ brand that makes compost using wild bracken, wild pony dung & sheeps wool. Recently added to our repertoire of composts, Dalefoots produce quality products for the growing trend in natural horticulture. We stock four of their products. 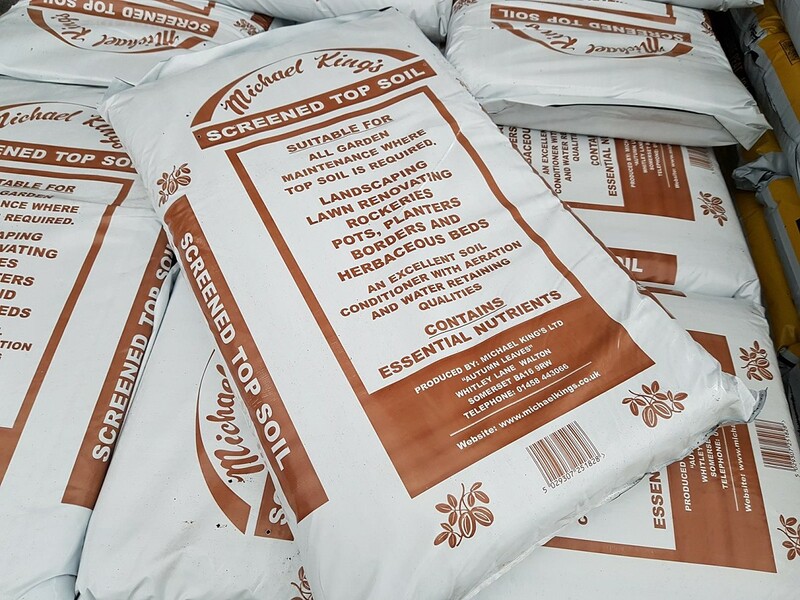 In this area you will also find pelleted feeds such as chicken manure or the excellent new addition, Fast Grow fertiliser which uses chicken manure plus organic seaweed in its production. 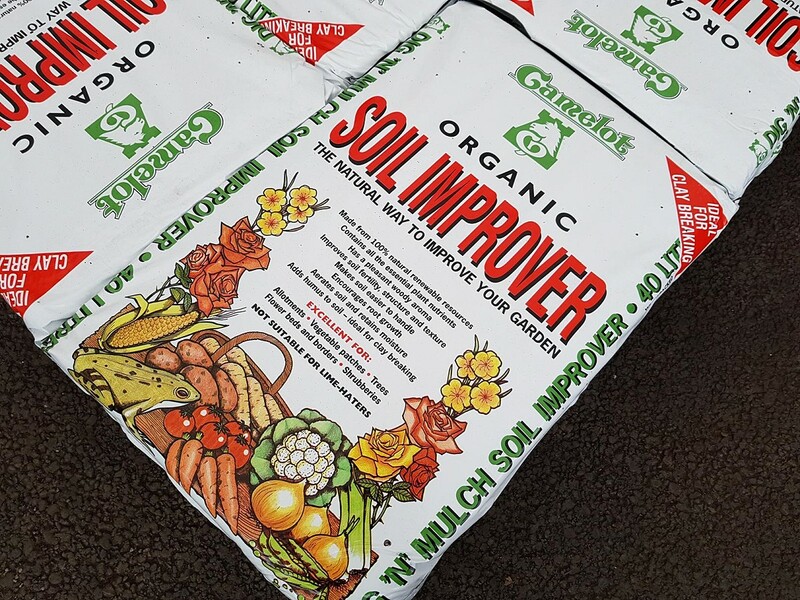 In addition to composts we also stock a range of sands, gravels and grits for horticultural use. The largest grade we provide is a pea gravel which is 5mm nominal size. We do not stock ornamental stones, cobbles or slates and prefer to leave these for other retailers who provide hard landscaping products. 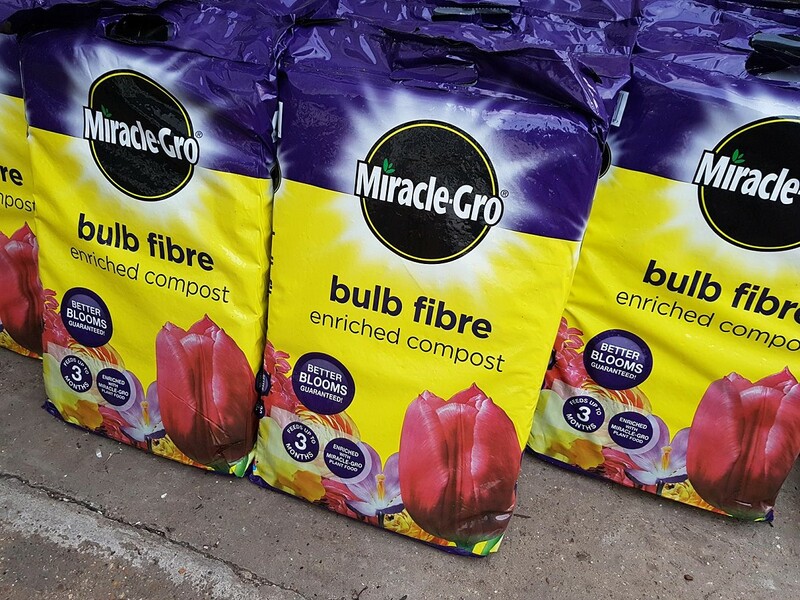 We also do not sell bulk bags of compost for the same reason. Garden retail like it used to be. Here at Clockhouse Nursery we pride ourselves in providing reasonably priced plants & the products you need to grow them effectively. So, no need to wade through the tide of unnecessary paraphernalia that you will find in most modern garden centres. No need to worry about parking either as we have over 150 spaces available. Plant Guarantees, Refunds & Returns. Over recent years we have put a lot of effort into making our nursery as easilly accessible as possible. The entire sales area & car park have hard sufaces made from either concrete or tarmac. Outside pathways are wide and our sales beds are sturdy brickwork allowing customers to sit & take a rest if one of our benches is too far away or already occupied. We feel that you will be able to navigate our nursery with ease, whether you are here for a leisurely browse or a calculated ‘in & out’ quick shop. 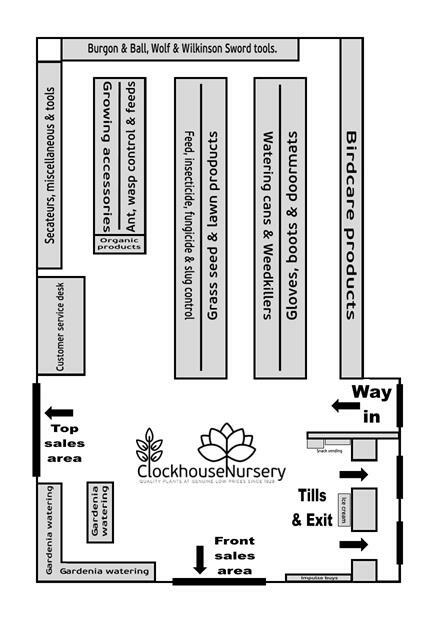 Free copies of the nursery map (shown to the right) are available from our customer services desk, they also have a shop layout map on the back of them. Don’t forget, a member of staff will be more than happy to point you in the right direction. We offer discounts on purchases which are open to everyone. Discounts do not apply to promotion items, special offer items, gift vouchers, delivery costs or compost. 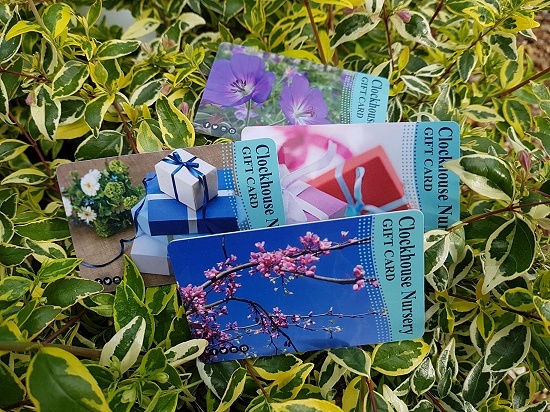 If you have absolutely no idea what to buy for as a gardening gift but you do know that the recipient is a Clockhouse Nursery customer, we can offer you a Clockhouse Nursery specific gift card. Available in four designs & similar to many highstreet gift cards in size. Simply request one at the tills, choose your design & it can then be pre loaded with an amount of your choice. Once loaded the amount on the card can be used as part payment or in its entirety. 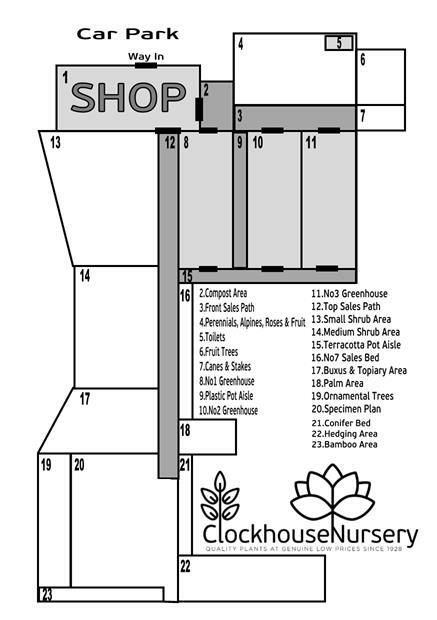 Please don’t forget to mention to your family & friends that they can become part of the Clockhouse “Garden Gang” by signing up for our loyalty card too! Currently we also accept and sell “National Garden Gift Vouchers” (paper form only) which are accepted at over 2,000 leading UK garden centres, shops and nurseries. 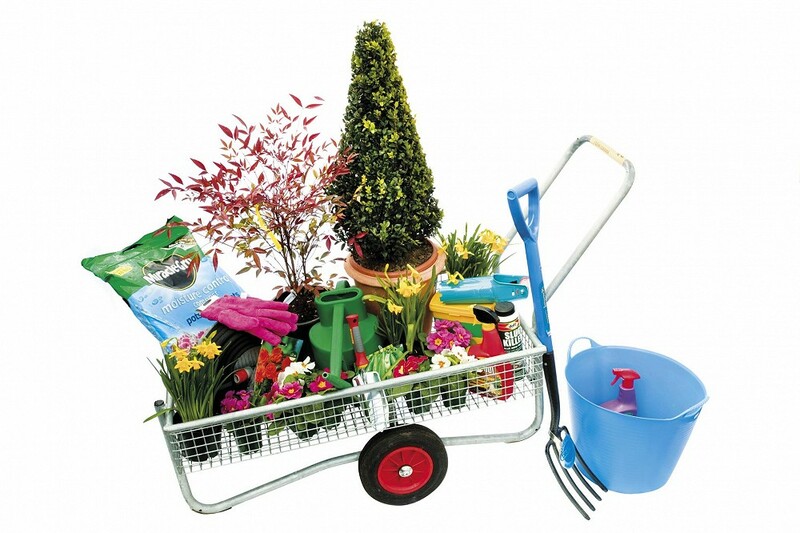 With National Garden Vouchers you have the choice of over 90,000 garden products from saplings to pagodas all gardeners will find something they’d like. A National Garden Gift Voucher is great for any special occasion, and whether the lucky recipient is an experienced gardener, or just starting out, they’ll be able to buy everything they need with the thoughtful gift. We are committed to ensuring that we sell excellent quality plants at what we deem to be reasonable prices. Many of our plants are grown here on site which enables us to maintain quality control to a very high level. Other plants are supplied by trusted companies, many of which have been in business for decades. We are always available to advise customers on the correct care for plants pre-purchase. Because of this confidence in our product we do not offer a plant guarantee. However should you experience a problem with your plant within six months of purchase we will consider either replacement, credit note or advise you on a course of action to take to resolve the issue. Should the plant need to be returned it must be accompanied with valid proof of purchase. A plant is a perishable good reliant on correct level of aftercare for survival. As such, after six months we relinquish responsibility for its nurturing & hand that duty 100% to the purchaser. 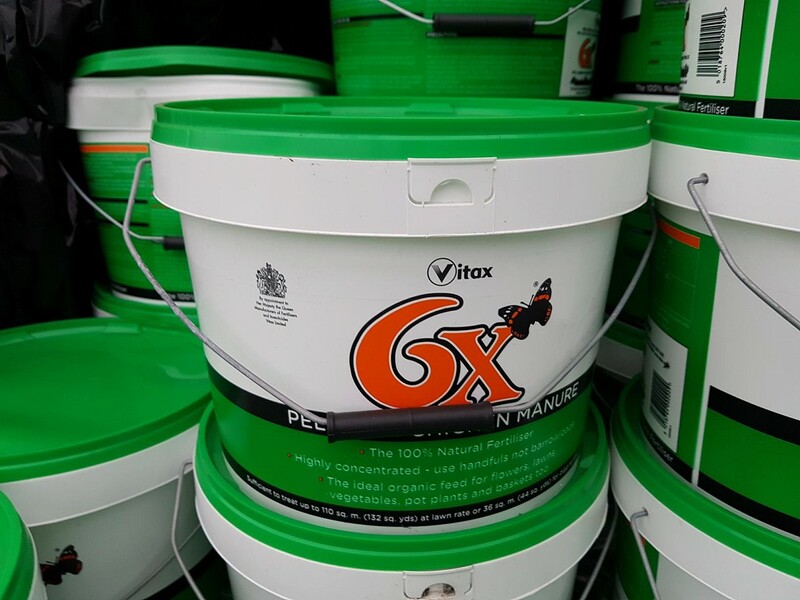 Should you change your mind about a ‘non plant’ product after purchase you may return it to us proving that the packaging has not been opened, the product has not been used, the product is still in saleable condition, with a valid receipt, within 28 days of purchase. Also, should the product be found to be faulty, it should be returned to us inside of 28 days with valid proof of purchase. Return or refund outside of 28 days may also be considered if the product meets the previous requirements stated. Plant returns should be within 5 working days. The plant will need to be in exactly the same condition as it was at the time of purchase and accompanied with a valid receipt. You will be offered credit note, cost equivalent exchange, or refund to the method of payment.This will be at the discretion of management. All refunds will be credited in the same fashion as initially received, i.e. if you paid by card, the refund will need to be issued to the same card. If you paid by cash, we can only offer a refund in cash. We do not offer refunds or guarantees on any sale or stock clearance items. In the Spring and Summer we’re open 9am - 5pm, 7 Days a week, including Bank Holidays! 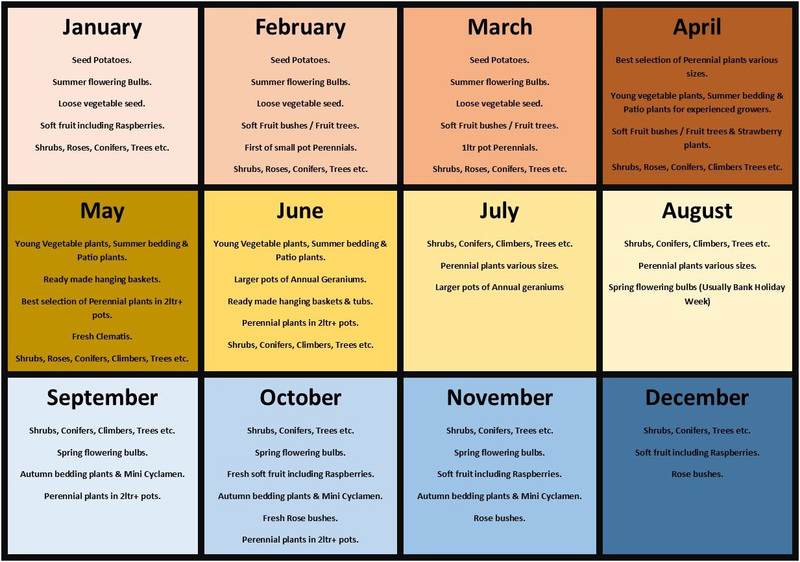 Here is a calender showing roughly what times of year different plants are available. Our Autumn and Winter times are 9am - 4pm, 7 days a week. 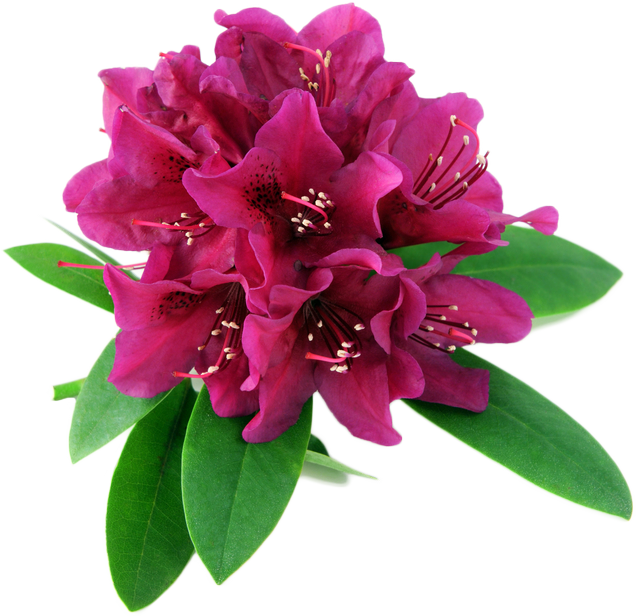 The best way to keep gardeners happy is to offer them plants of the highest quality, sold at reasonable prices. We are proud members of the HTA, the Horticultural Trades Association, which is ‘the’ UK’s garden trades association. The HTA has, for over 100 years, promoted the interests of its members and the industry at large. Being a member offers us various benefits and for you, the customer, the membership should provide you with some reassurance that we are an establishment of quality that takes its responsibilities to its customers seriously. 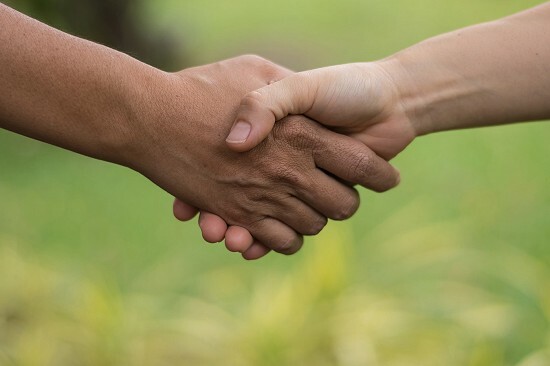 It also enables us to offer you access to HTA backed schemes such as the national gift vouchers which are redeemable at other HTA partner businesses across the country. Please feel free to send us a message or ask a question directly via this e-mail form.